Good waffle makers are a staple of any home, whether you like to start the day with waffles for breakfast covered in the most delicious toppings and combined with a super healthy smoothie, or even after dinner for you to enjoy some much-deserved desserts. The best waffle makers can now duplicate and often exceeding the waffles you’ve found at your favorite breakfast spot in town, and all without spending as much money to buy them. With a variety of settings, a plethora of batter recipes to test out, you can move on from trustworthy but ultimately boring cereal breakfasts and start the day the way you want. Making fast and fluffy waffles has never been more fun and more filling to keep you charged through to lunch time or to chill out and relax after dinner. The Dash Mini Maker is our top choice and boasts a wide range of cool and useful functions to make it a staple of your breakfast routine. Though small, it’s high performing and delivers excellent results on a par with even your favorite waffle house around. Dash know how busy you are in the morning, so it accommodates your busy schedule by deliver a fast heating time without getting too hot the batter sears immovably from the pan. In fact, it’s non-stick design ensure easy and straightforward waffle removal coming off all in one piece and looking just like it does on the picture. With it, you can also make paninis, hash browns, and biscuit pizzas, so you won’t feel restricted to just waffles, giving you the chance for breakfast, brunch, lunch, linner, dinner, and even a midnight snack should you get a hankering for it. However, the handle gets hot, so we’d advise care and maybe an oven mitt to save your fingers, and keep it out of reach of excited children, we want no tears ruining waffle day. Its versatility makes it one of the top-rated waffle makers around, while it’s size and easy-to-use functionality mean it’s perfect for kitchens and dorm rooms all over the country, and next; the world. 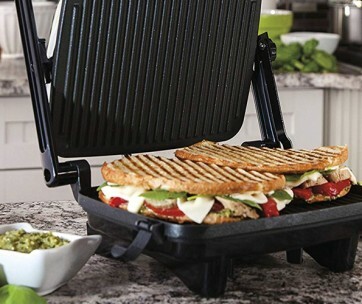 Make sure you also check our guide to the best panini presses. If you’re after an even more substantial option, the Throwback 3-in-1 Multifunction Countertop Mini Cupcake Donut and Waffle Maker is an awesome and hardworking option for the whole family. It allows you to create a variety of different snack types for you to make everything on Sunday evening to keep your family fueled throughout the week. It’s large enough so there’s little downtime between cooks, and it won’t take longer than 8 minutes depending on what you make and it delivers high-quality cooking with the 1400 watt surface. Despite this large surface area, it’s also compact enough for easy storage and without hogging too much space around your countertop. If you’re looking for full-sized waffles, though, you may be better off elsewhere, and while the operation is simple and effective, it’s only really suitable for snacks, creating waffle sticks instead of your standard waffle. If you’re throwing parties or even selling your own sweet snacks, this could be something to explore, but true waffle fans may not get as much from it. Still, it’s a highly useful waffle maker to have around the kitchen and ensures you’re never too far away from your next sugar fix. If you’re going a more healthy route, there are also vegan batter recipes you can look into, too. A kitchen gadget you need to have. Those seeking one of the best waffle makers also available at a great price and for great value should look at the Oster Belgian Waffle Maker, which is a useful little unit for singles or couples and anyone who just likes waffles. With an 8-inch surface, it creates large waffles with deep pockets perfect for a variety of toppings and syrups for customizing your waffles just how you like them. The adjustable temperature allows you to control the heat to find your perfect fluffiness or crispiness (or somewhere in between), while the indicator light lets you know when it’s done so you don’t overcook it. As for the exterior, it’s more durable than you’d expect for the price and feels sturdy enough for trustworthy storage and portability. It’s a little unsafe around the edges, though, so again we’d advise care when using it, but we’re sure you would be, anyway. The lack of features also may not be ideal for more serious waffle makers, but you don’t always need the very best to feel satisfied with your purchase. It’s not a waffle maker to set the world alight, but for simple operation for waffle lovers on a budget, you’re unlikely to find anything better for getting your morning waffle fix to get you through the day. Be sure to also check out our list of the best smart kitchen gadgets for more great items like this. The Cuisinart Double Belgian Waffle Maker is a high-quality option for households where everyone needs their waffles as soon as possible. It cooks 2 Belgian Waffles at the same time to give you and your partner or kids their fix before anyone gets too hangry, while also delivering high-quality cooking you’d typically expect only from diners up and down highways. If you’ve got a house full of people who like their waffles very specific, you’ll love the 6-setting control knob to ensure there’s something for everybody, while the non-stick coating is ideal for making clean up easier than ever. For further care and control, the LED indicators ensure you’ll know when your waffles are ready, and will hopefully halt the lingering smell of burning permeating the house. While it mostly feels well built, the handles feel a little flimsy, though, which considering the price may put you off. As long as you’re careful you’ll get light and fluffy waffles from a waffle machine that provides convenience without missing out on waffle quality. It’s a little pricey for some, but if you need delicious waffles for all occasions, you may look past the price and enjoy a waffle maker that’s trustworthy and full of plentiful, marvelous features. This also makes a perfect gift for foodies in your life. Our second Dash pick is the Dash No Mess Belgian Waffle Maker which is excellent news for those always trusted with cleaning up after a particularly messy waffle-making adventure. The batter is protected from getting all over the counter through useful overflow troughs on the side, which you can eat too once the waffles are finished. Like the other Dash we selected, it allows you to create paninis and hash browns, among other options to give you a little variety on days you don’t feel like waffles, as if that’s possible, and it’s also slightly bigger for larger appetites or larger households so no one’s waiting around. 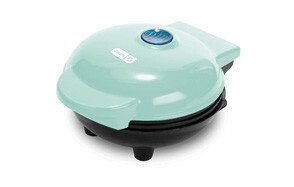 Despite its size, it heats quickly and cooks evenly to eliminate the risk of still-soggy waffle batter and instead delivering a delicious experience with every bite. However, while it heats quickly, and it’s large enough for four waffles at once, there’s still a little downtime with the next round of waffles. This isn’t too much of a big deal, though, and it’s only rarely you’ll have this problem. It’s still easy to store and the LED indicator prevents over cooking for great waffle results. Reliable and effective, it’s a great mid-range waffle maker for growing families. 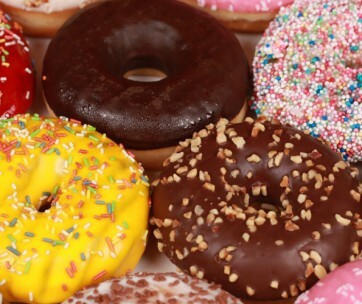 Our handy guide to the best donut makers features more great products like this. A waffle maker for true waffle-making aficionados, the Hamilton Beach Flip Belgian Waffle Maker is a more-than-suitable choice for making sure you’re never wanting for your waffle fix again. It’s one of the quickest ways to wolf down waffles short of literally injecting the batter directly into your veins (which we wouldn’t recommend) while still delivering top quality waffles that would be sure to score high at the Waffle World Championships. Using the wonder of gravity (and showing science skeptics it’s more than ‘just a theory’), it browns the batter perfectly on both sides without overdoing it and still delivers soft, light, fluffy waffles you can eat and eat and eat again before realizing you may have overdone it, while the adjustable browning control gives you further personalization abilities to ensure each waffle is just perfect. They will be every time, too, unless you’re making a stack of waffles for you, your partner, the kids, and your whole extended family plus the neighbors, plus any lucky folk who’ve wandered by. While the process is mostly speedy, there’s perhaps too much downtime between getting the perfect waffles ready, so you may end up with everyone finishing their waffles before you’ve gotten the chance. For smaller households, though, you’ll get an awesome flip waffle maker at a great price which is easy to use, easy to clean, and simple to store until next time. Love this product? 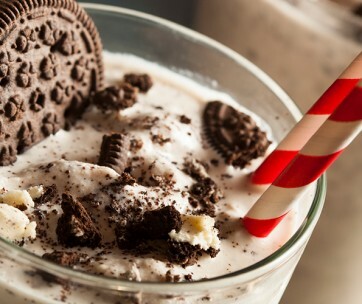 Check out our review of the best milkshake makers for our top picks. If you’re looking for a durable, robust, but also high-performing addition to your kitchen, the Black+Decker Flip Waffle Maker is a great place to look. It boasts the reliability of Black+Decker tools but instead of drilling holes in your wall or sawing pieces of lumber; it gives you something delicious to get a start on the day. The 7” plates offer enough room for 4 waffles, while the Rotate and Cook system ensures an even cook on both sides, and even though the waffles are a little too thin for some people’s liking, they’re still yummy enough to satisfy you on a Sunday morning before doing a whole lot of nothing – or more likely catching up on everything you didn’t do the day before. The non-stick surface is also useful for minimizing mess and helping you get the waffles from iron to plate in one piece, and the handle lock further prevents dripping and spillage. For flip waffle makers, this is essential and helps you create quality breakfasts and snacks every time. It’s lightweight, and cooks quickly to get you on your way, and it’s also cheaper than you’d expect while still delivering high-quality results for those both rushing out the door or looking forward to a relaxing morning in the yard. Find more great products like this by checking out our guide to the best pizza stones. Our final pick is the Cuisinart Vertical Waffle Maker which looks entirely different to other options in our selection and also works a little differently, too. Instead of the standard flat design, this upright design makes it easy to pour and reduces the chance of spillage to ensure simple clean up once you finish breakfast. There’s also 5 cooking settings to find the perfect crispiness, while the audible alert functions drag you from the living room and back to the kitchen to reveal your creations to the world with all the fanfare you deserve. For safety, the cool touch locking handle makes it easy to use, and will also help to prevent drippings all over your brand new marble countertop, although half-cooked waffle batter is delicious. Just because it’s a different design doesn’t mean you shouldn’t still exercise caution, though, and because it’s still a waffle maker, you’re likely to find steam creeping up your kitchen cupboards and walls, so if you’re concerned about potential damage, we’d advise you move it somewhere a clearer. If you’ve no cupboards or feel like they’re due an upgrade, this won’t bother you too much, and this gives you more of a chance to enjoy your waffles with a variety of delicious toppings healthy or not so healthy. They’re your waffles though, so who can tell you how to eat them, anyway? This is a perfect food gift for those who like to eat. We know we’ve picked an awesome range of the best waffle makers but it’s not as simple as looking up descriptions and photographs to see how cool they look. Instead, we researched several factors to help us determine which waffle makers are the best ones for you. Brand - The brand is often a decent indicator of quality, so we kept an eye out for well-known kitchen brands to help us get an idea of how good these waffle makers are. However, you’ll see there were some surprises we weren’t even expecting, particularly with the Black+Decker waffle maker, which while you may not be too sure about, we’d encourage you to check out. Reviews - Waffle makers reviews give us the chance to learn important things about the products the descriptions don’t always tell us. This includes things like evenness of cooking, ease of cleanup, and any potential dangers such as hot handles or sometimes-loose hinges. Without these reviews, we may not find the best products at all. Price - As always, we strive to find a wide range of prices to ensure all waffle lovers can get their hands on one. Our selection ranges from examples of a cheap waffle maker to ones which are more expensive to ensure we have something for everybody. While your chosen waffle maker may not be the most expensive, it doesn’t mean it isn’t the right one for you. Waffle makers come with a wide range of useful features to ensure you only make the best, most top quality waffles around. To ensure cooking process is easy and simple, look out for these features to ensure you make perfect waffles every time. While some waffle makers are ingenious feats of waffle-making engineering, others are more simple, so depending on your kitchen situation, you need to think about what works best for you. Indicator Lights and Sounds - LED lights and audible sounds built into the waffle maker will save you opening the lid too early or too late. However, they are not always a ‘Ready’ light, but instead one that shows you once the waffle maker has reach optimum cooking temperature. Waffle makers such as these will take some getting used to before finding the right cooking length. Multi-functionality - If you think you’ll tire of waffles every day, you can explore multifunctional options which also make paninis, mini donuts, pizza bites, and more. These products will typically cost more, but may be worth it if you’re looking for an all-in-one option. 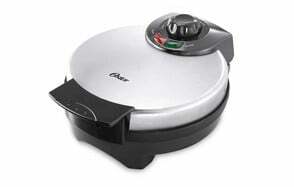 Flip - A flip waffle maker ensures both sides of the waffle cook evenly, which is essential for those who are massively particular about making the perfect waffles. Adjustable Temperature - Different people have different preferences for their waffles and sometimes a single temperature is not sufficient. Waffle makers with adjustable temperatures give you the option to make waffles of varying crispiness without affecting the quality of the overall waffle. If you’ve got people in your house who prefer super-crispy waffles but other who are more partial to soft and fluffy waffles, adjustable temperature is a must-have. Waffle Type - While any waffles are good waffles, you may have kids who have their preference, and even though you know there’s not much difference between square and round waffles, they aren’t so sure. To overcome this, you can find waffle makers of specific shapes to ensure there are no hunger strikes going on first thing in the morning. Number of Waffles - If you’ve got a large family, you need to look for larger waffle makers to ensure everyone eats at around the same time. A wider cooking surface means you can feed more people in on go, but this may take longer for the iron to heat to a sufficient temperature. Conversely, if you have a smaller household, a too-large surface may be too much, meaning waffles go to waste or you end up over-gorging. Safety - Because of how hot the product can get, look for protective casings to prevent the risk of burns and also properly protected cables and wires. If you have young kids, this is especially important as it reduces the risk of them injuring themselves. Easy-to-Clean - Waffle batter is notoriously challenging to clean up and cleaning up is the last thing you want to do after making some delicious breakfast. Non-stick surfaces reduce the amount of batter left over, while spill troughs also help make clean up simple. You can also look for removable irons to wipe clean without damaging the electronics. Storage - Compact waffle makers are more easily stored and also look for ways to easily wrap and store the power cable to prevent snagging on other appliances. For more reliable results, a cord hider is the perfect solution, but you won’t get this with every product. Round - An undisputed classic, a staple of diners coast to coast, and likely to be the style you find in movies, TV, and anything with a misplaced view of nostalgic Americana. These are traditional waffle irons and make thin waffles. Belgian Waffle - The Belgian waffle maker is arguably the most popular style, especially around Europe and more-European inspired countries. They are square and make thick waffles with a crispy outside and fluffy center. Waffle Iron - Not a strict waffle maker like what we’ve selected, a waffle iron is made on the stove and is almost entirely manual. They can be messy, and will sometimes require a lot of practice to get the waffles just right. Flip - These waffle makers seal around the middle once the batter is poured in and allow you to flip it over through an axis connected to the waffle maker. 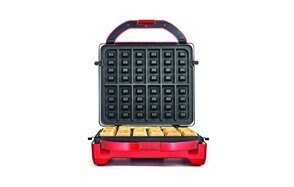 This system allows you to cook the waffle evenly on both sides and throughout to eliminate mess.